1. Using a vegetable peeler, remove 2 long pieces of orange peel, ensuring no white pith is attached. Using a serrated knife, cut the tops and bottoms off the oranges, then cut away the skin and pith. Slice the oranges and set aside in a serving bowl with any juice. 2. Warm the caster sugar in a large saucepan with 4 tbsp water over a very low heat. Add the reserved orange peel. When the sugar has dissolved, increase the heat and cook for 3 minutes or until a rich golden colour. Remove from heat and add the Cointreau. 3. Pour over the oranges and swirl to cover in caramel. Cool, cover and chill for up to 6 hours. Remove the peel. 4. Roughly crush the cantuccini with the end of a rolling pin, then set aside. Mix the mascarpone and yogurt, then add icing sugar or honey to sweeten to taste, and chill until needed. 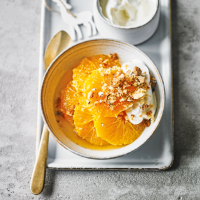 Serve the oranges with mascarpone cream and a scattering of cantuccini crumbs.